Never ever did I think I’d be walking waste-deep in ocean yet fully decked in my hiking gear. I was picking my way, shoes and all, around a granite boulder poking out in the bay and carrying my backpack above my head in an attempt not to drown my camera within my first 24-hours on Curieuse island. We were out on our first marine conservation survey, heading towards Grande Anse in search of nesting hawksbill and green turtles. To reach this beach, Pete the science officer had lead us into the sea and around the granitic rocks soaring overhead. We blindly followed, not knowing how long the route would be or how high the waves would get. We also didn’t know that he’d actually saved us from slogging straight up and down those same rocks in scorching tropical heat – an alternative and punishing route to Grande Anse that we’d soon get used to hiking almost daily. By “easy” I assumed she meant “simple”. There was no internet or social media or mirrors or scales or sitting in traffic for two hours at a time. Just two weeks of waking up before the sun in a dorm without a door, days spent immersed in nature on an isolated island, carrying out marine and terrestrial surveys, and falling into an exhausted sleep each night to the sound of the ocean and mosquitos buzzing overhead. To some that might sound like an easy life, to others it might seem gruelling. One thing is for sure though and that’s that, for me, those two weeks on Curieuse were spent living my best life. It started with two best friends marching through the airport with pillows in striped linen cases tucked under their arms. It probably looked like Sam and I were hurrying to catch our connecting flight to Mahé in the Seychelles. But, reality is we were just striding purposefully towards the nearest airport café in search of toasted chicken-mayo sandwiches. We also might have been a bit hangry, owing to the numerous side-eyes the pillows were getting. When one man in a suit finally asked, I wanted to respond that we’d stolen them from a hotel, duh. But I did the un-salty thing and told the truth – we were heading for Curieuse, a tiny, remote and mostly uninhabited island in the Seychelles Archipelago, and taking part in a volunteer marine conservation expedition with Global Vision International (GVI). We’d be staying in basic dorms and had to bring our own linen – including the pillows tucked under our arms. Anyway. That was back when we were still clean. A 5-hour flight later we found ourselves walking through international arrivals in Mahé and were smacked dead in the face by a thick wall of heat and (what felt like) 200% humidity. It took about 2.5 seconds for the sweat to bead on my skin and even less time for me to peel my denim jacket off (who let me pack that?). That specific clamminess and ickiness that could only result from a tropical climate is a sensation I’m not accustomed to. But, feeling persistently grubby would quickly become as familiar as my own name. Sam and I spent two days acclimatising to the heat in Beau Vallon in Mahé (and by “acclimatising” I mean wallowing in the waves and drinking Desperados), before packing up our suitcases and rolling them along the main street towards GVI’s designated pick-up point. I thought we looked v. self-sufficient, striding determinedly with our luggage. I even managed a cheery wave at Eddy, the hotel manager at our accommodation, as he drove past with the morning’s groceries. But, apparently we looked more “damsel in distress” than “strong independent woman” because he turned around, loaded us onto the back of his pick-up truck, and deposited us at the parking lot of La Perle Noir. That sounds kinda sketchy, but we were in the right place. There stood a group of volunteers around our age, fidgeting next to well-worn suitcases, wearing active wear and expressions of excitement mixed with apprehension that I’m sure reflected my own. We joined the multinational group and milled about, filling the silence with introductions and nervous laughter. I thought back to this moment near the end of our trip. How strange it was that I’d come to love like family each one of those then-strangers. Curieuse was once home to a leper colony and patients were treated there right up until 1965. But, the island was designated a Marine National Park in 1979 and all that remains of its prior use is the Doctor’s House and the GVI base, built from the ruins of the lepers’ quarters. The restored concrete and stone-walled rooms once occupied by the patients are now filled with bunk beds hung with mosquito nets. In other words, my sleeping quarters for the next couple weeks. Curieuse is found just across the bay from Praslin (which we’d travelled to by the “Chunder Ferry” from Mahé), and is reachable by a quick boat ride from the shores of Cote d’Or. Here our chariot awaited – a rubber duck affectionately (albeit curiously) named Dexter’s Crabtree. As Dexter sped past yachts bobbing in the bay and islets topped by luxury homes, I could barely contain the childlike excitement for everything I knew awaited on Curieuse. But, despite my prior research (girl gotta know what she’s getting herself into), I was wholly unprepared not only for the profound effect the island would have on me, but also for the striking beauty of it. The red-tinged mountain that gave Curieuse its former name of Ile Rouge loomed in the distance and then drew closer. It’s rimmed by dense clusters of coco de mer trees that are endemic to Curieuse and Praslin, as well as blindingly white sand and crystal clear water in varying, hyper-real shades of blue. Within these waters there are coral reefs and seagrass, sea turtles and tropical fish. Delve deeper into the rugged, untouched terrain, and there lies a mangrove swamp perfect for nursing sharks, and hundreds of giant Aldabra tortoises. For an island that’s less than 3 km2 in area, it packs in a diverse range of ecosystems. Dexter approached the sandy shore and bumped to a stop. On an island with no infrastructure, this was our front entrance. I could just make out the GVI base camp through the barrier of giant, leafy takamaka trees lining the beach. Other seasoned volunteers, looking tanned and capable, then emerged to welcome the newbies and help offload the luggage. There are no roads or cars or shops on Curieuse – just the Doctor’s House, the park ranger’s station and our base camp. With an official population of seven, the islands’s remoteness is only enhanced by the (almost) complete lack of tourists. Sure, they’d arrive by boat mid-morning, looking fresh and fabulous while we marched past all sweaty and un-fabulous. But, they’re only allowed access a few hours each day and their movements are limited. We, on the other hand, got to live there, putting us in the unique position to experience the island from a perspective that few are privy to. One of those viewpoints is the protected (and my favourite) bay of Fond Blanc. Here, a perfect beach reveals itself only at low-tide. After a tiring afternoon of marine-based surveys, we sat here while Pete husked a coconut using merely a rock, and handed us each a piece. He beckoned us to follow him into the glassy blue water, chewed a piece and spat it out. Suddenly we were surrounded by cheeky silver fish hungry for a snack, zigzagging in every direction. We were the sole people in the bay, and the only other sound besides us spitting out coconut, was that of the gentle waves mingling with our laughter. For this I’d trade fancy hotels on the mainland, room service and expensive cocktails every single time. A friend on the island likened our daily experience to training for the army. Each day was taken up by a full-on, rigorous routine. At around 6am, I’d wake to a chorus of ocean waves and my fellow volunteers creaking down from their bunks. As I made my way to the “ablution area”, I’d pass by the rest of the crew and offer a craggy “Hello” as they emerged from their dorms. They’d be rubbing sleep from their eyes or spitting toothpaste out onto unsuspecting skinks hidden in the bushes, preparing for daily chores at 7am. These entailed raking leaves off the sand around base, or the dreaded “bucket run”. The latter was usually done in grim silence, as it required forming a line between the ocean and the “big bucket” (used to flush the toilets) and filling it, bucket by bucket, passed along the line. I’d sometimes lose my appetite on the island from the heat, but safe to say I’d find it again after a bucket run. Following this spot of morning exercise, breakfast couldn’t come soon enough. The pair of volunteers on duty that day would prepare a spread of oats, fresh fruit and bread, and whatever else could be whipped up from the remaining supplies. The fridge only functioned twice a day, for three hours at a time, so we had to get creative with the fresh produce. Even raw pumpkin can pass as papaya if it’s sliced nicely enough. By 8am sharp, we had our hiking shoes and backpacks on, ready for action. If you weren’t feeling particularly awake at that point, the subsequent uphill hikes to reach the survey locations would soon have your heart racing and sweat dripping down your face. The heat was unforgivable, even that early in the morning. We’d be out in the sun for a couple hours, collecting data. Whether it was measuring coco de mer trees, catching, tagging and releasing sickle-fin lemon shark pups, recording nesting turtle tracks or conducting beach profiles, all of this gathered information contributes to preserving the natural environment of Curieuse and its status as a protected area. Ravenous, we’d head home to fuel up on lunch, and then commence round two of surveys at 1pm. Three hours later, 18 volunteers and four science officers would finally retire to base, quiet and weary. Most of us would melt into the ocean to cool down, soak those weary muscles and rinse off some of the grime accumulated over the day. When you’re walking 15km+ each day in 30-degree heat but are only allowed to shower every second day, it doesn’t take long to become a delicious island onion – made up of layers of sweat, dirt, dried sea salt, mosquito repellant and sunscreen. The rest of the afternoon would be whiled away reading in the hammocks, doing laundry, or tending to whatever injury or sunburn you might’ve picked up. If there was a “Who has the highest number of mosquito bites per limb” competition, I’d win every time. But, rather that than be “blister-bugged”, stung by a giant centipede or have a hairy-caterpillar rash on your body. Or, worse yet, have Welsh skin that isn’t accustomed to the sun and get third-degree burn on your feet on the second day. Not your typical picture of the luxe Seychelles life, is it? Dinner was at 6pm, which we’d eat while watching the sunset through the takamaka leaves, and by 8pm most of us had already fallen into a deep sleep, coloured by vivid dreams. Those that managed to fend off the exhaustion lingered in the ‘Bommie”, the communal space where we hung out and ate our meals. A couple beers would get passed around while playing cards, and I’d recount the day in my journal. But, eventually a quiet stillness would fall over base camp until sunrise, marking the start of another full-on day of work. It sounds like a lot of hard graft, but it doesn’t feel like that when you know that you’re right where you’re meant to be. I loved every minute of it. I even had a smile on my face when I had to swim underneath Dexer to scrape off the algae collecting on the boat’s belly. I just felt so fortunate to be living the island life. Humbled, even, by the simplicity of it, my close proximity to nature and all the unexpected wildlife encounters. I mean, there’s not many people that can say they basically had a 160kg giant Aldabra tortoise named Obama as a temporary pet, right? Seriously, Obama was basically the size of a small car. Or that they’ve stood knee-deep on the edge of a mangrove forest at sunrise, with nothing but a shark net, their best mate and two stingrays for company, lingering in the dark water a mere two metres away. Fruit bats flapped above our heads as we waited. We were supposed to be catching sickle-fin lemon shark pups, but all we caught was a mullet and I almost cried while struggling to release him. The work had me pushing past these emotional, mental and physical boundaries on the daily. Having to pick my way through dense tropical forest on steep mountain slopes in search of coco de mer trees was a lesson in trust and deep breathing – there was no designated pathway and the dead, dry leaves layered on the earth made the going slippery. While trying to keep one eye on my footing and the other on Pete lest we lost him, I was also on the lookout for palm spiders. Their webs had a habit of appearing out of nowhere and doing a disturb to my heart as I came face to face with my eight-legged nemesis. But, I had to be brave and get on with it. And on some days, the heat, hiking, and exhaustion would just get to me, and I’d doubt my own strength. But, after a couple days I knew the routes well enough and incorporated some zen yogi thoughts – i.e. “This too shall pass” or, more importantly, “Snacks await at base camp” – to get my mind and body through the most gruelling inclines. Then, of course, there was the B.R.U.V.S day (also known as the BEST day). Talking of personal boundaries, this survey smashed all of them. B.R.U.V.S stands for Baited Remote Underwater Video Surveys, and requires sending a large wire frame 20-30m down into the depths of the ocean. It’s fitted with bait and a GoPro to film the creatures that linger down below. That’s a freaky thought considering Sam and I had to dive in and help guide the wire frames steadily into the sea. I couldn’t see anything down there beyond my flippers and, above water, I kept losing site of Sam behind the lilting waves. I was half expecting a shark to emerge from the murky darkness (although v. glad one didn’t because probs would’ve drowned from fright before it got anywhere near me). But, I was so exhilarated to be out in the ocean conducting a fairly technical marine survey that I forgot to be scared. While the B.R.U.V.S did their thing, we explored the shallower waters of Fond Blanc. We swam with a marbled stingray and a feather-tail ray, and all the hundreds of multicoloured tropical fish that call the reefs around Curieuse home. Having spent a good couple hours swimming (never mind diving off the boat several times and hoisting ourselves back aboard via the v. graceful “seal flop”), we eventually retired to Fond Blanc’s pristine, tidal beach. That was when we got to feed freshly husked, chewed-up coconut to the fish. By the time we retrieved the B.R.U.V.S and returned to base, my arms were aching and my skin was nicely chargrilled. I was exhausted, ravenous and had spent so much time in the water that I could still taste the sea on my lips and feel the salt in my hair. But, to me, that’s the epitome of living the best island life. And the happiest. Still with me? This has been an epic journey. Okay, Emma, so where them sea turtles at? This is just between me and you, but I only saw one sea turtle while in the Seychelles. ONE. So I’m not entirely sure I can claim to have saved any. Although, the day I spotted that one flapping on the ocean floor below me was, next to B.R.U.V.S. day, my second favourite day of the trip. It wasn’t just the actual turtle sighting that had me feeling that way, though. Following the sighting, we all “seal-flopped” back into the boat, while laughing hysterically and chattering away. Morgan (one of the other science officers) then cranked the tunes from Dexter’s speakers and sped off towards Fond Blanc, the wind and blaring music drowning out our excited banter. Six volunteers now sat quiet and content aboard a speed boat, looking out onto the bay with with wide eyes and even wider grins. As the breeze cooled my skin and dried my salty hair, I could feel this general sense of wonder emanating from each person and reflecting my own happiness. 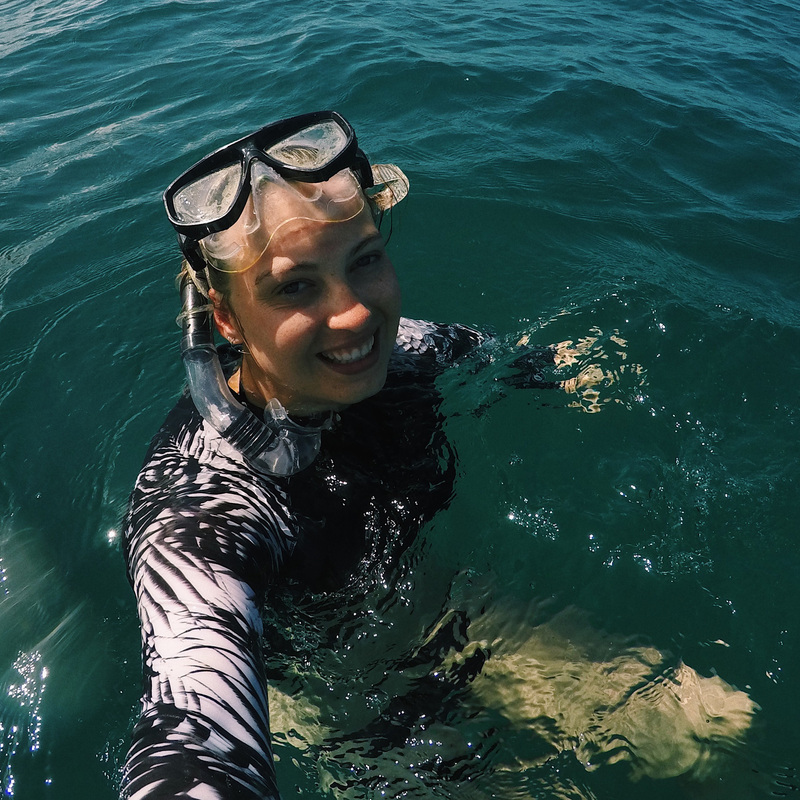 My first ever swim with a sea turtle was shared with like-minded people from all around the world who equally lose their minds with excitement over marine wildlife encounters. I’ve never felt so accepted, or so unashamedly myself. I might have shed a tear if the wind wasn’t drying out my eye balls. It was moments like these that made it very clear very quickly that this trip was about so much more than swimming with sea turtles. It was about meeting people with completely different backgrounds and life experiences, yet finding common ground with them and forming the strongest bonds in the strangest conditions. It was about contributing to a cause I hold close to my heart and rediscovering a desire to pursue marine conservation in my career. I’m endlessly fascinated by that whole other, strange world that lingers just below the surface of the sea and the myriad creatures that call it home. It is their home first and foremost and we can play an important role in protecting it (whether it’s embarking on something like GVI, or being aware of the impact of our daily actions. Like, choosing to refuse plastic straws for a simple start). Mostly, though, living on a remote tropical island so far removed from the silly, materialistic stresses of the modern world gave me a new perspective on life – a simpler one. So, I might only have seen one turtle. But I’ve returned home with a full heart enriched with vitamin sea, special bonds with special humans, a couple scrapes and bruises and many a ridiculous, epic story to tell. I’ve also come home with a feeling of restlessness that I cannot shake. There’s so much more world to see, so many more oceans to explore and creatures to befriend. I might have gained a lot, but it’s safe to say I also left a big piece of my heart on that little island. And that saving sea turtles in the Seychelles is just the start.